Finished my Odin BAF yesterday. The left arm and cape are King Thor's, but I think he looks cool with them too. As a figure, he's okay. The cape pops off very easily and gets in the way of the shoulder armor, there's not a lot of bend in the elbows, and I had to cut a bit of his waist wrap to free up some movement in the legs, but you can get some good poses out of him, and he looks awesome just standing there. Not a marvel legend, but has anyone seen the 4 inch Scarlet Witch? I'm wondering if she's even worth getting. There are no 6 inch figures for her and Quicksilver coming out is there? I haven't seen Quicksilver or Vision in the 4 inch line yet. :/ I get the Avengers as 4 inch figures to save on money. Quicksilver and Vision are not yet part of the 4 inch line. Still trying to find Scarlet Witch though. I've heard mixed reports of the wave with her in it appearing at Target and Wal-Mart. The one I found was at TRU. And thanks for the info on Vision and Quicksilver. There is no movie version of SW in the 6in scale and none forthcoming, but there is A recent 6in SW in the Allfather Odin wave thats out now. Ive already got her. I'm sure we'll get her 6 in eventually. ^_^ Maybe with more super-hero like attire in a future movie. How is the articulation on the 4 inch figures? As you may or may not have seen (depending on whether or not you look in the "cool toy thread" i only have the 6 inch figures. And i have the 6 inch comic Scarlet Witch. Stood her up with the 5 movie Avengers i have. I hope they release a 6 inch of her movie version. I just watched it and both Quicksilver and Scarlet Witch were amazing. No spoilers, i promise. But my friend and i both agree that both studios, Fox and Marvel, handled their Quicksilvers very well. I saw the film too, and ill say this, Fox and MS needs to come to a deal. Id like for ALL of Marvel's heroes to be in the same cinematic universe. Yeah, i saw those lines recently. I do want Vision and War Machine to go with my movie Avengers (especially since i missed Iron Man 2s release of War Machine). Outside of those 2, amd the obvious build a figures, i can't remember who is in the lines. I still need to play catch up with the All Father,HobGoblin, and Thanos waves. I was hoping that they'd have released 6 inch versions to coincide with the movie. But oh well. I've seen some nice looking Scarlet Witch customs out there. I would too. I mean, i think an Avengers vs. X-Men movie would be great, if done properly. But at least Marvel and Sony came to an agreement for Spider-man. The articulation is nonexistent on 4 inch Scarlet Witch. She's a pain to keep standing, too. That looks sweet man. I still need to get the Guardians line. Any of your comic shops having sales for free comic book day? Mine is have 30% off all figures and graphic novels. Oh, wow! That's pretty cool. I don't go to many comic shops, but I may need to do some investigating. If any of them do have this, it may be an expensive weekend! And thanks! I was trying to figure out what to do, and I just decided to have GotG on the left, Avengers up front and center, and the Netflix crew on the right, with SHIELD behind the Avengers. That reminds me: what do you guys think the likelihood of having Agents of SHIELD figures made from the TV show? You're welcome. I need to get some kind of case to display them. Right now they're just on flat surfaces. Need to update some pics too. Got DCUC Zatanna, Direct pre-new 52 Raven, New 52 Batgirl, Red She-Hulk, Bucky Cap, Scarlet Spider (Kane), and Iron Man Mk3 yesterday. Yeah, i know mine has some great sales. Heh on May 4th all Dark Horse Star Wars graphic novels will be $5. So if anybody wants any let me know. Big Star Wars shop in general, even named Rebel Base. As for the S.H.I.E.L.D figures, it's likely they'll release some at some point. I would think. Maybe store exclusive or online exclusive. Speaking of, when does the amazon 4 pack release? I need a movie Thor and Hawkeye. Have the other movie versions (aside from the AoU newbies). I don't know much about that Amazon pack. And you said you already had the others: is this not the first time they released Bruce Banner? The Amazon pack is the first time Banner will be released. I hope they do an additional 4 pack, including Scarlet Witch, Quiksilver, Vision and Falcon! I WANT EVERY MCU FIGURE POSSIBLE! anyone have a release date on the amazon pack? Got into collecting these last summer. 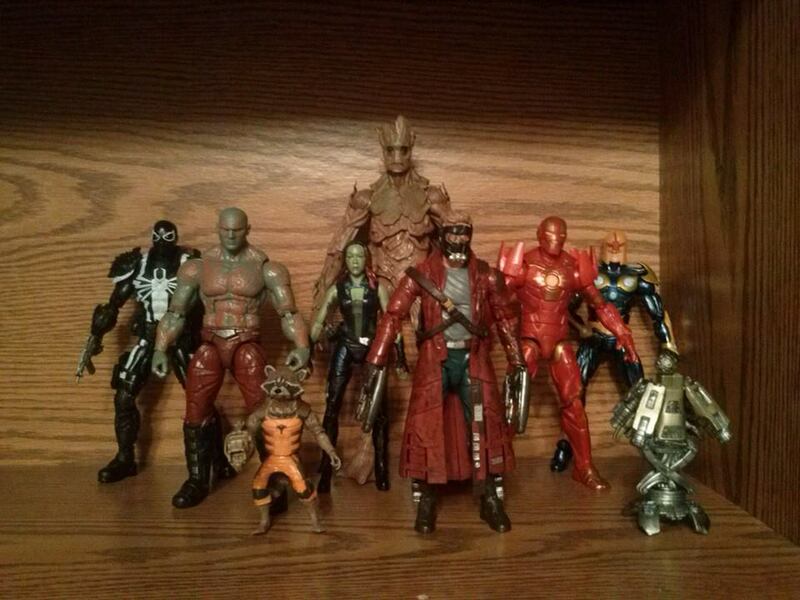 So far I have the Guardians and most of the Thanos AoU line (Winter Soldier Cap standing in). 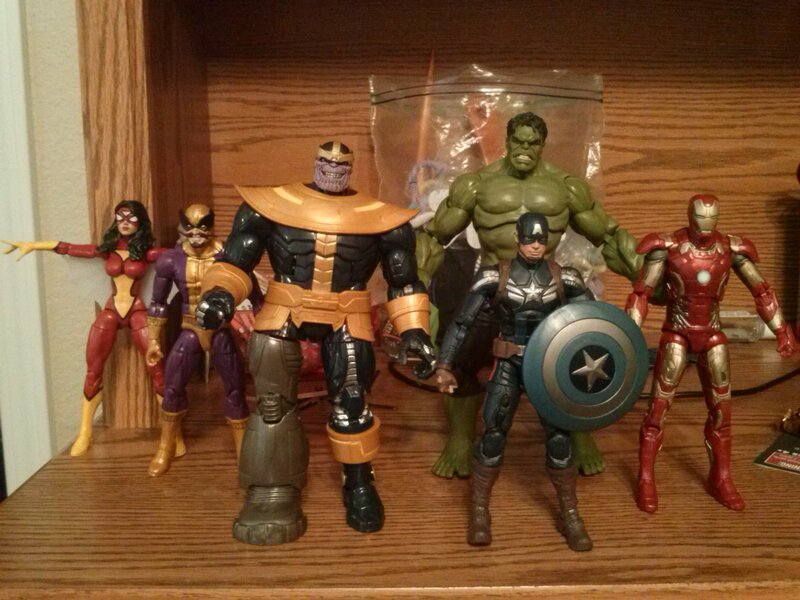 Along with some figures from the Walmart Avengers line, and other assorted figures in the same scale. Also a decent collection of Spider-Men, and Black Widow and the Winter Soldier, I just don't pictures of them at the moment. It is, to my knowledge. And while i want him, Thor and Hawkeye are the priorites for me. It looks to be a better Thor than the Thor/Avengers release. And Hawkeye, i would prefer the Sun Glasses look over the new (actually really love the AoU sleeved outfit for him), but he doesn't wear the sun glasses at all i don't think. But i do want Banner. Last edited by GoldLightning; May 1st, 2015 at 11:19 PM. So got Marvel Legends Hulk and Iron Man today. I'll start with Iron Man first. He's a decent figure, but I think he could've been a bit better. He's got some good articulation and some nice details, but his paint job is kinda sloppy. It doesn't look too bad at first, but as soon as you start examining the figure the iffy paint job becomes pretty apparent. Also I really wish he would've come with another closed hand and another open hand. Plus I think his shoulder pieces should've been on a hinge and not this soft rubber plastic. Not a bad figure by any means but he's got problems. I really like the Hulk figure though. I like his size and overall look. He's very nicely articulated with my only gripe being his feet don't have the most movemet. Other than that he's a very solid figure.